The Amityville Horror Truth Website examines various topics relating to the Amityville Haunting. Here you will find the real interviews, documentation and evidence from the people that were there. 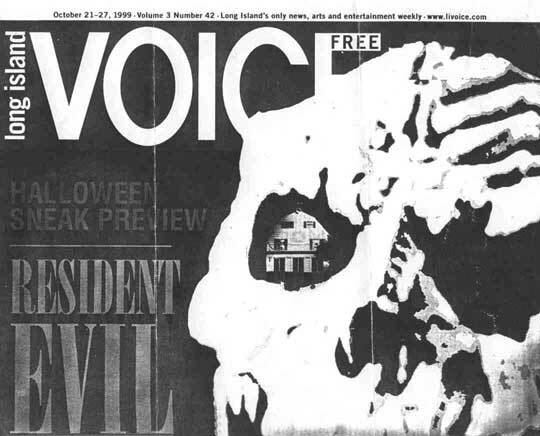 Here is our giant archive of all the Amityville-related newspaper and magazine articles (that we could find) from over the years! William Weber calls the haunting a sham. He is frequently described as the man who "confessed" the haunting was a hoax. But is that really accurate? Find out in this article written by Dan Nolte, which examines the relationship between the Lutzes and William Weber (defense attorney for Ronnie DeFeo, the man who killed his family in the Amityville house a year before it was purchased by the Lutzes). George Lutz discusses the horrifying events that occurred to him and his family during their 28 day stay in the infamous Amityville House. Jodie doesn't like George... and neither does MGM. Among other things, this interview discusses a few 'surprises' held within the framework of the new Amityville Horror remake . Trust us, though, it won't ruin your enjoyment any more or any less. George Lutz filed suit June 10, 2005, against Dimension Films, Metro-Goldwyn-Mayer and others, including two screen writers. Long Island Voice article from 1999 about the 25th anniversary of the DeFeo murders. On Page 3, Ric Osuna is quoted as saying he has proof 'that the house is truly haunted.' Less than a year later, Ric would be telling people he had proof that it was all a hoax. On October 31, 2002, ABCNews.com posted an interview with several prominent players involved in the Amityville mystery. Here is a reprint of that article, courtesy of ABC News. 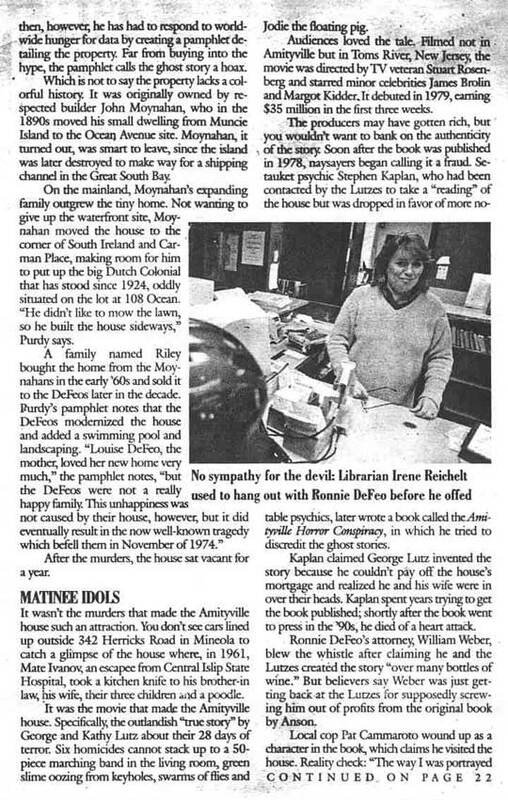 ABC Primetime Thursday interviewed Mr. George Lutz in 2002, and did a segment on the Amityville Horror. They also did an online chat with him, the transcription of the chat session is available here. Dan Farrands recalls the events leading up to the 2005 remake of The Amityville Horror. An article written by Sherbetbizarre that explores Ric Osuna's strange transformation from a pro-haunting believer, to a hardened skeptic that cries 'hoax'! Some claim this crime scene photograph is evidence that the DeFeos were awake at the time of their deaths – not shot in their beds. But what does it really show? This new analysis questions if the photograph was even taken inside the DeFeo house. Does this photograph show a mysterious 7th victim in the DeFeo home? Is it evidence of police misconduct, or, like with the 'Bloody Shoe Photograph mentioned above, is it possible that this photograph comes from an entirely different crime scene? WARNING: Page contains a graphic photo of a dead child. This first of three articles by Howard provides us with a history of Native Americans on Long Island and the area surrounding the Amityville house. These series of articles will end with Howard's theory explaining how this information pertains to the haunting experienced by the Lutz family in Amityville. Watch for the second article to be included soon. 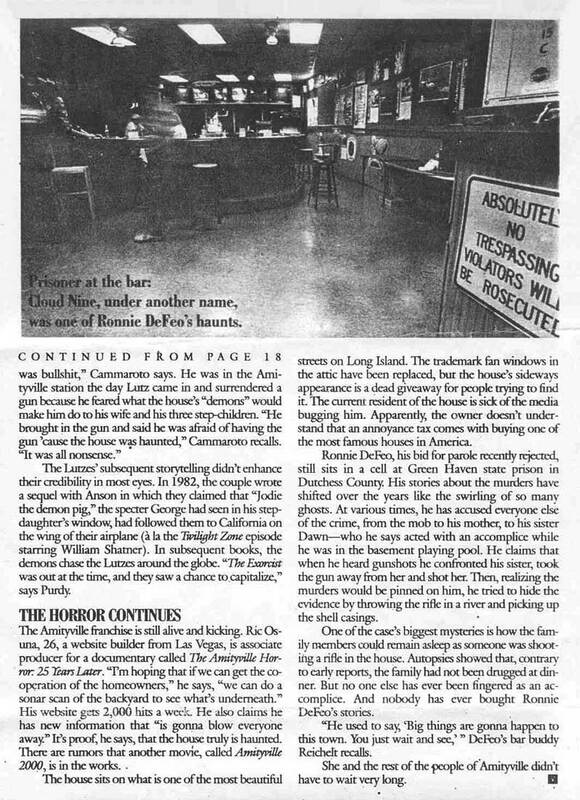 In this 1986 article - his first newspaper interview since the 1974 murders that spawned 'The Amityville Horror' – convicted mass murderer Ronald DeFeo now claims that he did not massacre his family after all. Being convicted of fraud wasn't enough – now Geraldine 'DeFeo' Gates has really gone to the dogs, as shown in these newspaper reports. Dan Farrands talks with Icons of Fright about his role in producing the History's Mysteries documentaries on The Amityville Horror, and recounts his first meetings with the Lutz family. Dan also gives us his thoughts on the new movie remake.